"Oh, Dakuwaqa!" 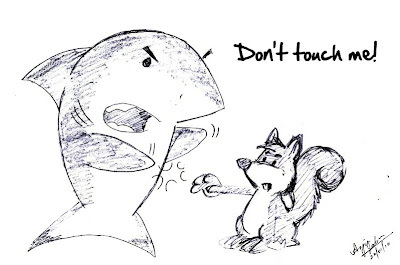 - The Shark comics and cartoons: Don't touch me! I have a friend who does this. It's a very unpredictable action and hence I find it funny enough to draw. I was trying to think of a character that could be the recipient of this action and after much trial and error and processes of elimination, I came up with this. Much to my reluctance. I started off with a different version which sort of seems more like irritability. I wasn't too happy about it but it seemed probable. This is a policy that most people believe that I am in agreement with, by the way. 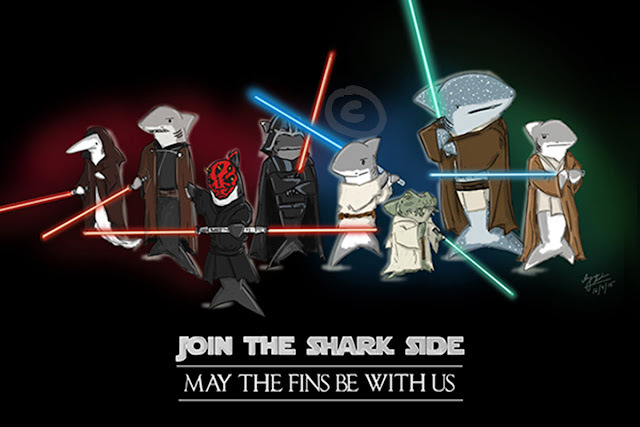 It's quite funny. I do find that, in excess, it can be a bit annoying. 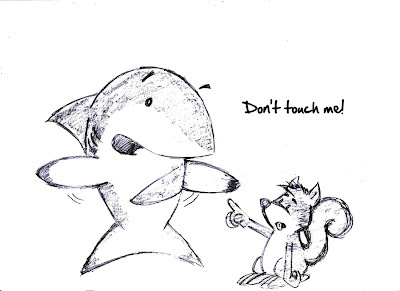 ps - uh oh, I just realised that I have a "Don't touch me!" badge on the journal blog which I'd made months ago. So this is not really new then! But the squirrel is new. That makes it better, I suppose.